If it’s a pump, we can help. New pumps and spares. If you need overhauls, rebuilds, or machining - we can do it! Full machining facilities are available to re-condition and re-manufacture if necessary. 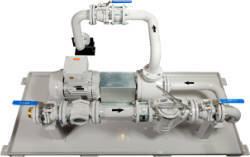 All pumps refurbished to an "As New Condition" come complete with warranty and report. On and off site pump servicing, collection and delivery. No fuss. Real service with the immediate needs you demand. No fuss. New pumps and spares sourced and delivered correctly and on time. No fuss. Diagnostics and troubleshooting, helpful advice. No problem.